Area: 667 sq km.Location: The park borders the southwest corner of Garibaldi Provincial Park and extends south to Widgeon Lake along the west side of Pitt Lake and Pitt River. 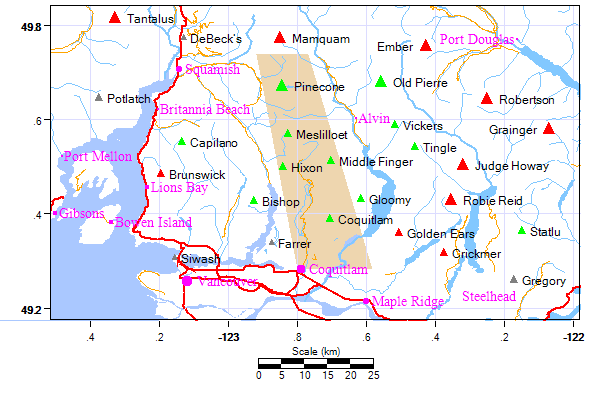 Terrain: This 38 000 hectare park is the largest in the Lower Mainland. Widgeon Slough is the largest freshwater marsh in southwestern British Columbia and the Meslillooet icefield the closest glacier to Vancouver. Much of the park is old-growth forests with several alpine lakes and rugged mountains. History: Pincone-Burke Provincial Park was created in 1996 after a lengthy battle between loggers and environmentalists. The park is part of the traditional territory of the Katzie First Nations people and remains a wilderness area with no facilities.